The recently concluded Bali Ministerial marks an important milestone in the WTO negotiations. The National Food Security Act, 2013 in India has brought the issue of food security and hunger within developing countries to the forefront of the negotiations in the WTO. In this context, the G-33 proposal addressing the issue of non-recognition of food security concerns of developing countries within the global trade rules reflected a meaningful unity within developing countries on the question of hunger. Such a unity is expected and can be situated within the growing difficulties of maintaining food sovereignty of poor populations in the backdrop of food market volatility over the last decade. The Bali Ministerial concluded with certain interim agreements, the acceptance of the Peace Clause by India being highlighted, with regard to food security programmes in developing countries. The All India Kisan Sabha (AIKS) has attempted to make an appraisal of the Bali Ministerial outcomes and understand the larger implications for farmers and poor people in India and the developing world. Such an exercise leads the AIKS to adopt the following position. The AIKS rejects the abject surrender at the WTO Ministerial by the Commerce Minister and demands that the Government refrain from accepting the provisions of the unequal Ministerial Decision on Public Stockholding for Food Security Purposes without discussion with and approval of the States and Parliament. The AIKS opposes this WTO Ministerial Decision, which constrains and infringes upon our sovereign right to provide price support to farmers as well as ensure food security for the hungry millions. 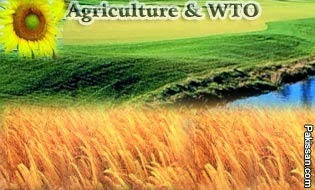 India has only given a new lease of life to the failed WTO, which was becoming irrelevant after the Doha Round. The reasons behind this position are the following. The only possible gain that the Government can claim is that the Peace Clause will be in place in the interim until a permanent solution is found. The Commerce Minister’s public posturing and the text agreed to are at variance. On reading the Ministerial Decision carefully, one can understand how it will seriously compromise India’s food security and farmers’ livelihoods. India has failed to secure permanent protection to safeguard the food security and price support for farmers and assert it as a non-negotiable sovereign right. It has meekly agreed to the insistence of the developed world to accept guilt, by accepting the interim clause that mandates reporting of violations of de minimis Aggregate Measure of Support (AMS) levels. The agreement will threaten expansion of present programmes of food security and price support to farmers as well as future programmes with such objectives. In effect, the US, EU and other developed countries have brokered a successful deal with the Commerce Minister to protect the interests of the rich nations and their agribusinesses. Standstill Provision: The Ministerial Decision has a standstill provision incorporated in the text which clearly states that the Peace Clause or Due Restraint Provisions shall only be used to protect the public stockholding programmes “existing as of the date of this Decision”. The Footnote Number 3 is deceptive and even as it states that this Decision does not preclude developing countries from introducing programmes of public stockholding for food security purposes, in the name of Safeguards against Circumvention, Para 4 clearly states that they should not distort trade and Para 5 prohibits an increase of the support subject to the Member’s Bound Total Aggregate Measure of Support (AMS) or the de minimis limits. This will freeze all scope of expansion of food security or price support to farmers in India and other G 33 countries, which have no such programmes in place at present, will also be deprived. The crop basket under purview of Minimum Support Prices cannot be increased. Pulses, cooking oil and crops other than those described as “traditional staples” by the WTO cannot be included in the food security programme. Even the quantity of food grains procured cannot be increased beyond the procurement as of date which could have serious implications for the Food Security Programme. It may also mean entitlements under Food Security Programmes as also the MSP of different crops will have to be frozen. Further the Support Price valuation will not be based on current prices as India was demanding and will remain to be based on 1987-88 prices. Deliberate Ambiguity: While the Ministerial Decision in Para 2 states that it will be valid “in the interim, until a permanent solution is found” it also states in Para 1 that such a solution is for adoption at the 11th Ministerial Conference, which is 4 years hence. Para 2 also states that the Members shall refrain from challenging through the WTO Dispute Settlement Mechanism “provided that the conditions set out” in the Decision are met. The WTO Secretariat described this as a “constructive ambiguity” and it actually deliberately dilutes the G-33 demand that this should be applicable till a permanent settlement is found under the Agreement on Agriculture (AoA) and the Agreement on Subsidies and Countervailing Measures (ASCM). The present Decision at the behest of the USA and EU is applicable only to AoA implying that Members may drag India to the WTO Dispute Settlement Mechanism under ASCM. Conditions and Monitoring: Mandatory compliance to onerous data and transparency requirements and conditions that there should be no distortion of trade or adverse effects on food security of other members. This is an infringement on a Nation’s sovereign decision-making process and could have serious implications. The Agriculture Ministry and Food and Consumer Affairs Ministry will be forced to comply with these unilaterally decided conditions on an annual basis. Failure to supply the data can be tantamount to suspension of Peace Clause since it has been made conditional to meet the transparency requirement. Countries are also to provide information on their administered or release prices and the volume of stocks purchased as well as how they arrived at these figures. This could unnecessarily expose domestic policies and priorities to being questioned in the WTO’s Committee on Agriculture. Such detailed notification and transparency requirements have not been demanded of the developed countries who would enjoy Special and Differential Treatment regarding transparency and notification. Silence on Subsidies of Rich Countries: The rich countries led by the USA and the EU have retained their unrestricted right to channelise billions of dollars to their farmers and food aid programmes and the WTO has failed to deal with issues like the export subsidies of rich nations and US cotton subsidies, which the WTO Hong Kong Ministerial had promised to address in 2005. India has failed in the WTO Ministerial to give leadership to the Third World countries and ensure removal of such subsidies. Work Programme and Trade Facilitation: The Bali Ministerial also came up with an imbalanced package which will mean expensive customs agreement for developing countries in the name of Trade Facilitation. This is tailor-made to promote the interests of predatory agribusinesses who monopolise trade. The commitment to a Work Programme could lead to the damaging trade liberalisation agenda of Doha Round being brought in and developing countries will have to cough up much more in addition to paying with trade facilitation now for arriving at a permanent solution. Solidarity of Third World Countries Broken: India was seen as the leader of the G-33 countries and the Third World looked up to its role. However, the Commerce Minister broke the solidarity built meticulously over the years and capitulated to the hard bargain from USA and developed countries. India failed to create a coalition of developing countries to collectively oppose the completely distorted Bali package. As a result, India could not contribute at all towards the correction of the fundamental problems of the present international trade regime. On the whole, the WTO agreement will continue to be a major threat to the working people in less-developed countries. India also did not insist on ending the inhuman 60-year US blockade on Cuba. The Latin American, African and Asian countries have been let down by India’s decision. The AIKS calls upon all progressive sections of the country to organize and resist such decisions against the people and the sovereignty of the country. The struggle for protecting food sovereignty and farmers’ interests in India and other developing countries needs to be strengthened in the wake of the unfavourable negotiations at the Bali Ministerial. *The author works with the All India Kisan Sabha.